Archbishop Emeritus Desmond Tutu and His Holiness the Dalai Lama were recognized this Sunday for their accomplishments in love and forgiveness during a peace conference in Vancouver. 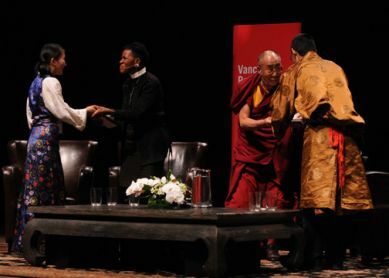 The two Nobel Laureates received the first ever Prize for Love and Forgiveness as part of the opening events of the 2009 Vancouver Peace Summit, organized by the Dalai Lama Center for Peace and Education. Sponsored by Michigan-based research organization the Fetzer Institute, the award included a $100,000 monetary prize and a handcrafted, inscribed journal. The Archbishop Emeritus' daughter, the Reverend Mpho Tutu, accepted the prize on her father's behalf. "Love, compassion and forgiveness have the power to change, the power to heal and the power to transform any situation--no matter how violent or troubled--into something that is generative and life-giving," said Tom Beech, president and CEO of the Fetzer Institute. "The Dalai Lama and Archbishop Tutu are renowned, revered, respected and loved the world over. In giving this award, the Fetzer Institute celebrates their humanity and the consistency with which their lives stand for compassion in the face of isolation, love in the face of fear and forgiveness in the face of violence."